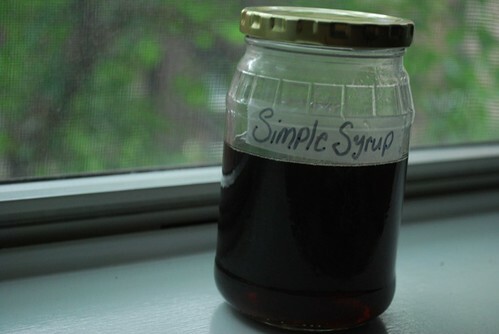 Recipe: Simple Syrup | Dinner Love. I usually just dissolve the sugar into the coffee before I let it cool and add ice, but I decided to make some simple syrup instead. The nice thing about having simple syrup around is that you can use it for alcoholic beverages too (woo-hoo!) and it’s easier to tailor your coffee once it’s already iced. Sometimes I add my sugar to the hot coffee, throw in ice and milk, and I realize that I added too much or too little sugar and there isn’t much I can do at that point. 😦 SIMPALLLLL SYRUP TO THE RESCUUUUE! If you wanted you could also use a different extract – like ginger, or orange blossom, cinnamon. Just take into account what you want to use the finished product for. 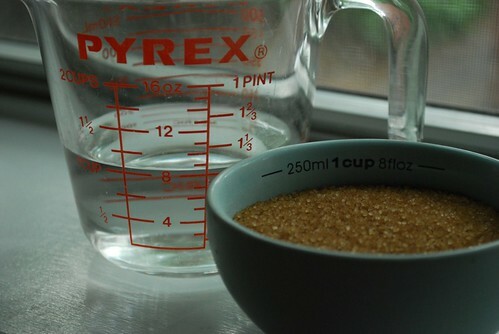 The most important part of this recipe is the water to sugar ratio, which should be one to one. So, if you wanted to lower or increase your quantities that’s fine as long as you keep it one to one. Mix together your sugar, water and extract and heat to just boiling. Stir occasionally as it heats and make sure the sugar is dissolving. Keep it at a gentle simmer for a few minutes, then take off the heat and allow to cool. Once cooled, pour into a bottle or jar for easy serving. I used this super-fancy jar. My syrup is so dark because of the turbinado sugar. Mmm! Mix into all of your delicious iced beverages. Your iced beverages will never suffer from lack of sweetness again! I want the tall and skinny measuring glass. It is very cool. Isn’t it?? I got it on sale at Anthropologie. I think I showed it to you when you visited back in December. I made a simple syrup just like this, but let it simmer away for a good 15 minutes with three crushed cardamom pods in it. I normally am “eh” about iced coffee (like you, if I want coffee that means I want HOT steaming coffee) until july and august when its disgusting here. 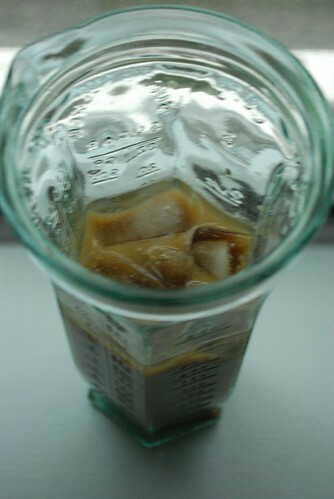 Anyway, the cardamom syrup is EFFING incredible in iced coffee. SO good. I didn’t let it simmer for too long because I was worried about it evaporating too much. The addition of cardamom sounds amazing, though. 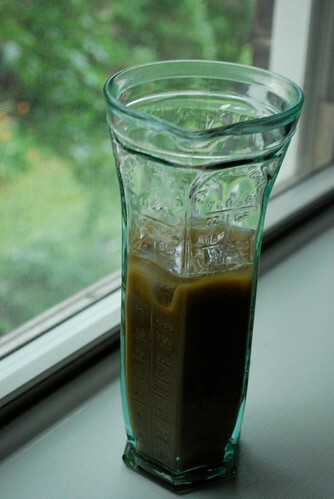 I like to put cinnamon in my iced coffee sometimes (and cinnamon+cardamom rock!) so I should definitely try that! I find that letting it simmer for a while only makes it so that you never accidentally water down the coffee with too much syrup! (which I’ve done with crappy store bought syrup). Also, now I feel like I need to try making a syrup with cinnamon sticks and cardamom pods. Yummm!! To California. I have a full time summer job and the kitchen here is not very big. The blogging will continue in September! Great. I look forward to more. I only just found you and you went away!